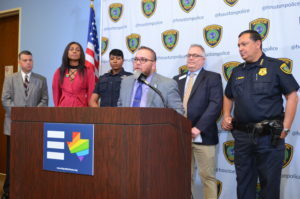 Houston, TX (April 11, 2018) – Equality Texas, the largest statewide organization solely dedicated to securing full equality for LGBTQ Texans, honored National Crime Victims’ Rights Week in Houston with the Houston Police Department and the Montrose Center to raise awareness about a new report that shows Texas is at the Epicenter of an ‘Epidemic of Violence’ Against LGBTQ People. Texas led the United States in hate-related homicides against LGBTQ people, which jumped by 86 percent from 2016 to 2017. Seven Texans were murdered, including three in Houston: two gay Asian men who were targeted on a dating site and one transgender woman of color. Fifty-two LGBTQ people in the United States were killed in 2017 as a result of hate-related violence, according to a new report by the National Coalition of Anti-Violence Programs (NCAVP). That’s the highest number recorded in the 20 years that NCAVP has tracked this information, representing an 86 percent increase from 2016. Today, Equality Texas is unveiling a new campaign to combat LGBTQ violence and discrimination as we redouble our efforts to fight inequality and the ignorance that feeds it. We’re calling on Texans to join us because if you attack one Texan, you attack all Texans. The Montrose Center is the nation’s 5th largest LGBTQ community center and more than 100,000 Houstonians find hope through their programs and services each year. 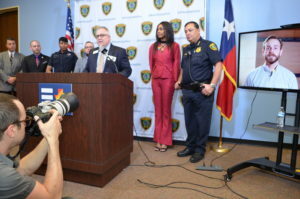 The Center is celebrating its 40th year of advocating for lesbian, gay, bisexual, and transgender Houstonians, but during this 40th anniversary they are experiencing a troubling rise in the number of LGBTQ individuals who have experienced violence and hate crimes. From 2016 until 2018 there has been more than a 14% increase in clients seeking support through their anti violence and hate crimes program. In 2017 and 2018, 17% of these survivors identified as transgender. This was a 32% increase in the number of transgender Houstonians seeking services for hate crimes and violence since 2015. This alarming increase in Houston has mirrored a national increase in violence facing LGBTQ individuals. Working together we are bringing attention to the series of murders and hate crimes targeting LGBTQ Texans in Austin, Dallas, Houston and across the state. 44-year-old Glenser Solimon was found dead on February 25, 2017 in Houston. Soliman was lured to his death while using a dating app. Two cousins, Brandon Alexander Lyons and Jerrett Jamal Allen have been charged with capital murder. The cousins are also suspected in the murder of 26-year-old An Vinh Nguyen who was last seen on March 31, 2017 and is presumed dead. It is believed that Nguyen was lured to his death while using a dating app. Nguyen was a University of Houston student, a member of Houston’s LGBTQ community, and worked part time as an optician. 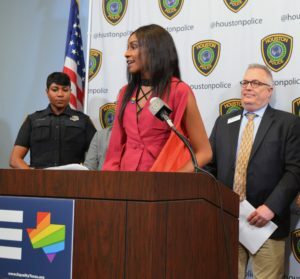 Following the murder of Seals, the Houston Police Department is partnering with Equality Texas and the Montrose Center and implementing new training to ensure officers are more educated when they respond to incidents regarding transgender Houstonians. “The Houston Police Department will not tolerate acts of violence against any member of our community, regardless of race, national origin, religion, gender, sexual orientation, or gender expression. It is imperative that we not only appreciate one another’s differences, but make it a priority to protect any person or group whose differences make them a target for violence. Our Department is creating new polices to educate and bring awareness to the intricacies of how criminal cases involving the LGBTQ, and specifically the transgender community, are handled. 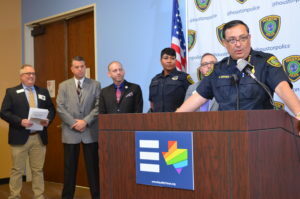 We are extremely proud to stand with our LGBTQ community members to make Houston safer for all who live, work or visit our diverse and welcoming city,” said Chief Art Acevedo, Houston Police Department. National Crime Victims’ Rights Week is a time to bring attention to crime victims across Texas and the country to raise awareness. Equality Texas is the largest statewide organization working to secure full equality for lesbian, gay, bisexual, transgender and queer Texans through political action, education, community organizing, and collaboration. The Equality Texas Foundation works to secure full equality for lesbian, gay, bisexual, transgender, and queer Texans through education, community organizing, and collaboration.